Born in the Aosta Valley, a small alpine region in Northwest Italy, Ettore Personnettaz has always been drawn to the mountains. His love of the mountains, and specifically the snow, led him to explore freestyle and freeride snowboarding, and become a National Snowboard Instructor. Now, Ettore focuses on the backcountry, where he loves to discover new routes and first descents. 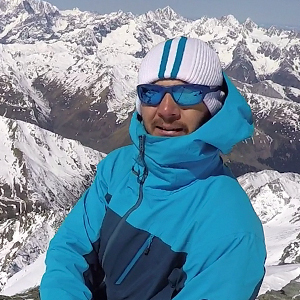 Wanting to share his passion, Ettore founded Freeride Alliance with a team of pro friends. The organization has a goal of promoting a respect for the mountains, sharing their appreciation for nature, and, in general, the importance of having a good approach to snowboarding/skiing peaks. I had two epic adventures last winter: the first descent in "Carkoon Couloir" in my valley (Great-Saint-Bernard); and the descent from the South-East Face of Grivola Peak (3.969m), the most beautiful "Himalayan" mountain of Aosta Valley. New experiences with splitboarders in new locations thanks to the Wild Splitboard Camps 2019. Researching and riding new lines around the Alps of Aosta Valley (I), Switzerland, and France. I'm lucky to have snowboarder friends with whom I share a passion for our mountains. We are always looking for quiet places with untouched slopes, away from the bustle of everyday life. We are looking for the real contact with nature. I think this is the spirit that gave birth to snowboarding and continues to make it unique. The study and the pursuit of the perfect line from a mountain: beautiful, aesthetic, continuous, without interruption ... breathless ... from the top! I ride Spark R&D gear for its simplicity, constant innovation, and maximum efficiency in any conditions in the mountains. It is perfect for conquering new peaks and descents.